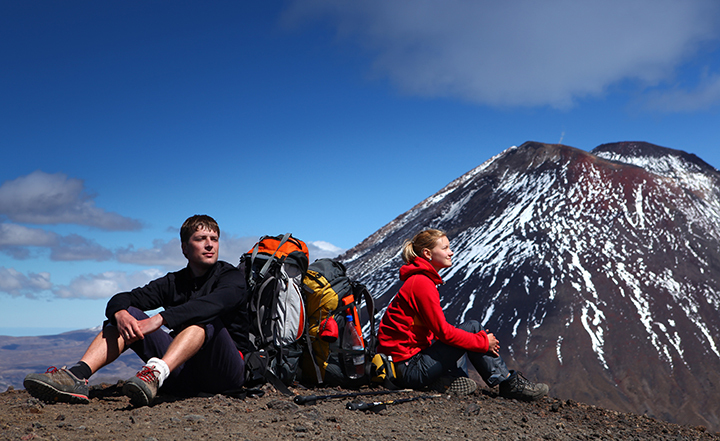 It may be the middle of winter, but that doesn’t mean there’s nothing to do at the Tongariro National Park! Summer may be warmer and have the longer days, but there’s something to be said for winter. Those fresh, clear days and star strewn nights convey something magical about New Zealand and our wondrous landscape. And after a day of excitement, adventure, and exploration, there’s nothing quite like getting warm and cosy in front of an open fire – something only a cold winter night provides. So what is there to do? Well, we’ve picked these top 4 winter activities you can enjoy here at the Tongariro National Park, all available through the Park Hotel. Winter wouldn’t be winter without some snow, and with over 1000 hectares of skiable terrain, Mt Ruapehu is one of the best skiing and snowboarding sites in New Zealand. As New Zealand’s largest ski resort, Mt Ruapehu has three ski fields; Whakapapa, Turoa, and Tukino. With slopes for all ages and abilities, you’re sure to find exactly what you’re looking for, be it a fun family holiday, or a thrilling adventure expedition. Whakapapa has Happy Valley, considered to be New Zealand’s best beginners area, perfect for those of us who have never skied before, especially children. 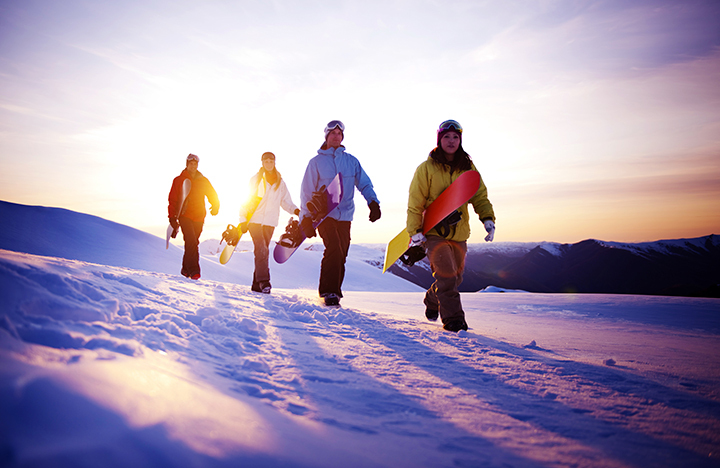 A mere 15 minutes from Whakapapa, The Park Hotel is ideally located for your ski holiday. Race up early for the morning’s fresh tracks and be home soon after the last run to enjoy a drink at the Spiral Bar or a soak in one of our outdoor hot tubs. The Tongariro Alpine Crossing is considered one of the best hikes in the world, and with views of snow-capped mountains, active volcanoes, and gorgeous emerald lakes, it’s hard to disagree. Open all year round (weather permitting), New Zealand’s most spectacular walk can be completed in a day, but is still challenging enough for experienced trampers. The crossing is a World Heritage Site, taking in some of Aotearoa’s most stunning natural scenery, including the volcanic peaks of Ngauruhoe, Tongariro and Ruapehu. During the winter months, the crossing can be dangerous, with the weather turning suddenly. We strongly recommend a guide to help you through the unpredictable conditions. We recommend Adrift Guided Outdoor Adventures. They have a wealth of knowledge of the National Park area and will ensure your experience is a safe and unforgettable one. We offer a special winter package of the Tongariro Alpine Crossing, which includes a guided tour for two people, two nights’ accommodation, daily continental breakfast, return transport for the crossing and energy packed lunches. If you feel like you’ve seen Mt Ngauruhoe before, then you probably recognise it from the big screen. It was the Tongariro National Park that Peter Jackson chose as the setting for Mordor in the Lord of the Rings movies, with Mt Ngauruhoetransforming into the iconic Mount Doom. The movies inadvertently marketed the New Zealand landscape to the world, and helped tourism become the country’s biggest export, bringing in over $7 billion per year. You too can experience the epic adventure of Frodo and the Fellowship by visiting these real-life landmarks for yourself! Unfortunately, no official Lord of the Rings tour exists in the Tongariro National Park area (yet), but the Department of Conservation has helpfully put together a list of coordinates for key scenes in the movies for you to explore. All the Mordor filming locations are close to the Park Hotel, so you can use us as a base on your quest to return the one ring to the fires of Mount Doom! 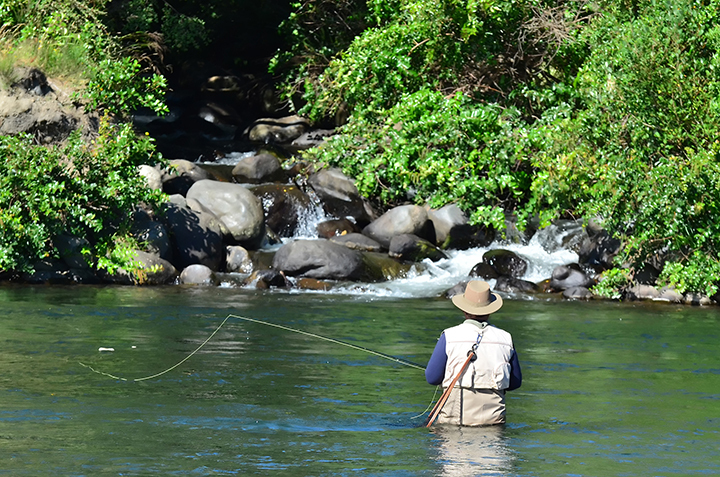 New Zealand has an abundance of pristine trout and salmon fishing waters, making it an angler’s paradise. The crystal-clear rivers and lakes around National Park provide the perfect environment for freshwater fishing. The Tongariro River is world famous for its trout fishing, and the Tongariro River Rafting company provides guided freshwater fishing trips for anglers of all ages and experience. Alternatively, Turangi “Trout Fishing Capital of the World” is just a 35-minute drive from The Park Hotel and home to the National Trout Centre. Here you can learn more about New Zealand’s fresh water environment during your visit to the Aquarium and Trout Hatchery. The Tongariro National Park is open all year round, with sites, activities, and adventures all close at hand! Whether you’re experiencing some of the world’s best skiing and snowboarding at Whakapapa, taking in the spectacular views of the Alpine Crossing, catching some delicious trout, or on a pilgrimage to your favourite movie locations, the Park Hotel can help. Contact us today and book your room at our luxurious hotel. Use us as a base to explore the park, returning to a relaxed, friendly environment, with delicious food and soothing outdoor hot tubs. Winter never felt so good!